Our "almost famous" slogan above means a lot to us and we hope it does to you as well! See how becoming a member answers the question above! Become a MEMBER to stretch the value of your $ and support YOUR local farm! Farmer, Russell Vollmer--ready to be your "go-to" farmer! Instead of a traditional CSA, we are very pleased to announce our new Vollmer Farm Membership program that we think many of you will prefer and enjoy. By using your “My Farm” membership card (similar to a gift card) as payment at ANY of our stands, farmers' market locations and our main farm market in Bunn, NC—you can buy what you want, where you want and when you want. No more three weeks of beets in your CSA box, unless you want them of course! By choosing a Vollmer Farm Membership, we can still maintain the very special “from our farm to your table” relationship that we have built over the years. We thank you in advance, for answering the well-known question, “Who’s Your Farmer?” by continuing to choose Uncle Russell and Vollmer Farm. There are 3 levels of membership, all offering more value than what you will actually pay! With each membership level, you simply use your "My Farm" card at ANY of our area stands or farmers' markets, including our Bunn Farm Market, U-Pick field, Ice Cream Shop and the Back Forty! In addition, throughout the year we will be announcing special Members Only events, promotions and discounts! Level 1- (5% bonus) Pay $100 and receive $105 on your “My Farm” card. Level 2- (10% bonus + PLUS) Pay $250 and receive $275 on your “My Farm” card. PLUS, you’ll get 2 FREE Back Forty passes to use in the Fall! $303 total value! Level 3- (15% bonus + PLUS) Pay $500 and receive $575 on your “My Farm” card. PLUS, you’ll get 4 FREE Back Forty passes to use in the Fall. $631 total value! Thank you for being such an important customer and friend to Vollmer Farm. Please allow us to be YOUR go-to farmer to provide you and your family with the most delicious, healthy produce around! Who's Your Farmer? 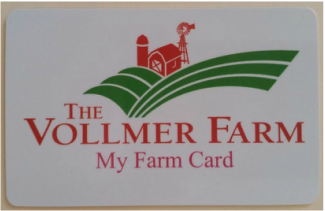 Here's what your Vollmer Farm membership card will look like! It can be used at our main farm year round and at any of our spring & summer Farmers' Market locations! Simply click the card to access the enrollment page and we will mail out your membership card right away!